The sun was just setting in the sky. When I put my head back on the sweet smelling grass and looked up, I saw vivid pastel colors streaming around gigantic puffy clouds that looked like cotton candy. I could hear the rocking chair swaying back and forth the way it always did every evening on our front porch. Grandma Jimmy Lee was having another smoke. She always smoked on that noisy swing. Swaying and puffing simultaneously. Her hair teased out so high. Rumor had it that it was where she kept her life’s saving. I believe the rumors. Mama was inside baking and grandma was supposed to be watching us. The only thing she was watching was her cold cocktail. Her cigarette in one hand, her cold cocktail perched comfortably in the other hand. It wouldn’t be cold for too long with the intense heat that was rapidly melting her ice cubes. We didn’t mind that she never paid us any attention. We didn’t have a care in the world. Me and my cousins were tired from chasing each other around the street. There hardly ever was a car that would pass by these sleepy streets. Grandma was always dreaming of the old days back in Georgia. She sometimes told us that life wasn’t the same here in the Glades. Maybe that was why she always had a sad look in her eyes. Through the thin front screen door we could smell what mama was working so hard on. I was too lazy to move to see if her cake was almost ready. Mama was a good baker. I heard she was the best baker in town. When papa was alive, he always used to tell mama that her cakes were so good because she baked from her soul. I didn’t know what that meant, but he told me one day I would. The moment came that we were waiting for. The screen door pushed open with mama holding her gorgeous cake. She made it different this time, but it smelled just the way it always did, like caramel candies that we got at the corner candy store. Sometimes we take change from grandma’s pockets when she falls asleep on that swing and run over to get those sticky and delicious caramel candies. Mama gave grandma the first slice of cake. Then it was my turn. The cake was so moist and you could taste the sweet butter. Caramel was oozing from the middle in little waves. The whipped cream was fluffy and just perfect. The strawberries were fresh and juicy. Vibrant red berries we had picked earlier on the farm decorated the top of this splendid cake. This is a cake that was baked from mama’s soul. Pull up a chair and have a slice with us. Come share a story. Grandma will make you a cocktail and reminisce about the old days. For whipped cream: In a large mixing bowl place the whipping cream, vanilla extract, and sugar and stir to combine. Cover and chill the bowl and wire whisk in the refrigerator for at least 30 minutes. When chilled, beat the mixture until stiff peaks form. 1. Preheat the oven to 350°. Butter three 8-inch cake pans; line the bottoms with parchment paper. Butter the parchment and flour the pans, tapping out the excess. 2. In a bowl, mix 1/4 cup of the milk with the egg whites and vanilla extract. In the bowl of a standing mixer fitted with the paddle, mix the flour with the sugar, baking powder and salt. Add the butter and the remaining 3/4 cup of milk. Beat at low speed until blended, then beat at medium speed until smooth, 1 minute. Beat in the egg white mixture in 3 batches. 3. In another bowl, using an electric mixer, beat the cream until soft peaks form. Stir one-third of the whipped cream into the batter, then fold in the rest. Divide the batter between the pans and smooth the tops. Bake for 25 minutes, until a toothpick inserted in the centers comes out clean. Let the cakes cool on a rack for 10 minutes. Unmold the cakes and peel off the parchment. Invert the cakes and let cool completely. 4. In a saucepan, stir 2 1/2 cups of the sugar with the corn syrup and milk. Cook over moderate heat, stirring until the sugar dissolves. Keep warm. 5. Sprinkle the remaining 1/2 cup of sugar in a deep, heavy saucepan. Cook the sugar over moderate heat, swirling occasionally, until an amber caramel forms. Carefully pour the warm milk mixture over the caramel. Cook over moderately high heat, stirring, until the caramel dissolves. Stop stirring and cook until the caramel registers 235° on a candy thermometer. Remove from the heat. Stir in the butter, vanilla and 1/4 cup of the heavy cream. Strain the caramel into the bowl of a standing mixer. Let cool for 15 minutes. 6. Beat the caramel at medium speed, gradually adding the remaining 1/4 cup of cream, until creamy, about 15 minutes. 7. Set 1 cake layer on a plate. Pour enough icing over the layer to cover the top. Top with a second cake layer and cover it with icing. Add the final cake layer. 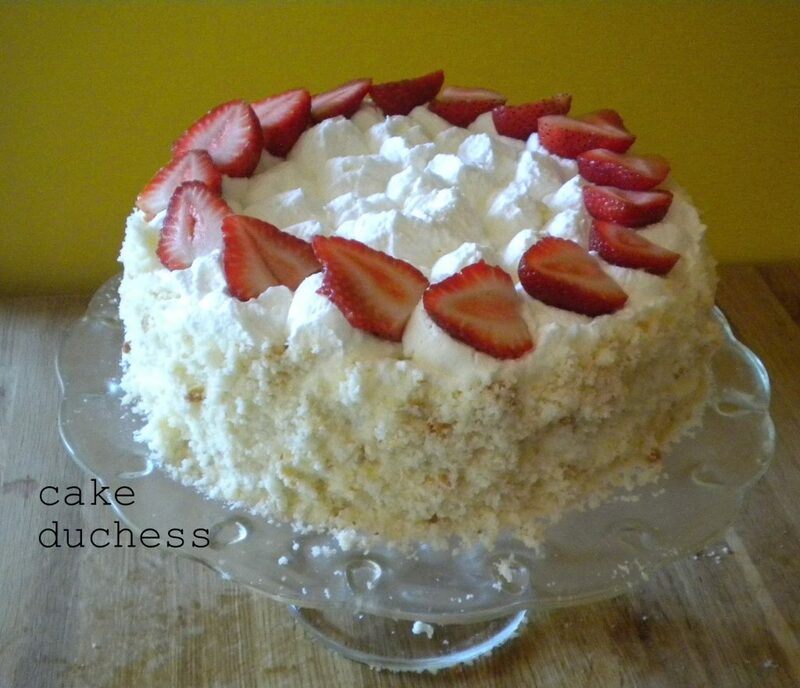 Spread the whipped cream around the sides and top of the cake. Use an offset spatula to spread the icing gently around the cake. If you like, decorate the top with some fresh berries. Chill for an hour and then serve. *I only used 2 cake pans. I sliced the cakes in the middle. If you use 3 cake pans, your cake will be much higher.The kids ended up eating the extra caramel on one of the extra cake layers while they were waiting for me to decorate and chill the cake. *I didn’t end up using all of the caramel from the recipe as I had made whipped cream instead to decorate the top and sides. 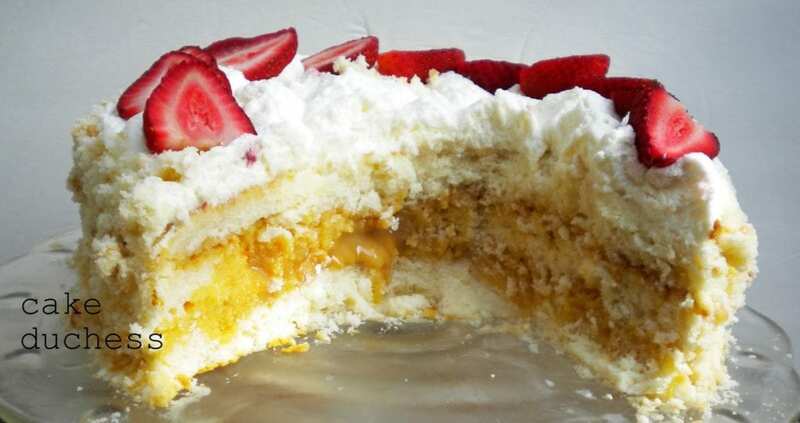 If you would like to use caramel to decorate the entire cake, there should be enough with the recipe above for the whole cake. it with the offset spatula. *I smoothed off the top of the cake. I cut it off carefully and blended it in the food processor. Those are the crumbs you see around the sides of the cake. I did that so the cake would be more even. This cake was just delicious. Look at the gorgeous caramel. This cake is beautiful for the holidays. Lora, this caramel cake looks out of this world. I love the filling that is so delicious and gooey looking. Beautiful! OMG, Lora, every dessert outdoes the previous one, looking forward to the next! 🙂 Absolutely stunning! I feel like I NEED this! If only I were a more talented baker! Any tips on how to make this with store bought caramel? i looooove strawberry and love your cake! Oh my. My mouth is watering just looking at the pictures. This definitely sounds like the best ever caramel cake! Wish I had a piece of this for breakfast! I love the caramel oozing out! I need to think of a reason to make this. Wow, girl, that is one heck of a cake. All that caramel oozing out when you slice it, just gorgeous! Why do you torture me with such things??? This looks so good, I wish I could just jump into that picture and gobble it up! Yum…. This sounds and looks so delicious!! Great opening story! You painted a great picture with your words – It's really something – what a recipe can inspire, isn't it? 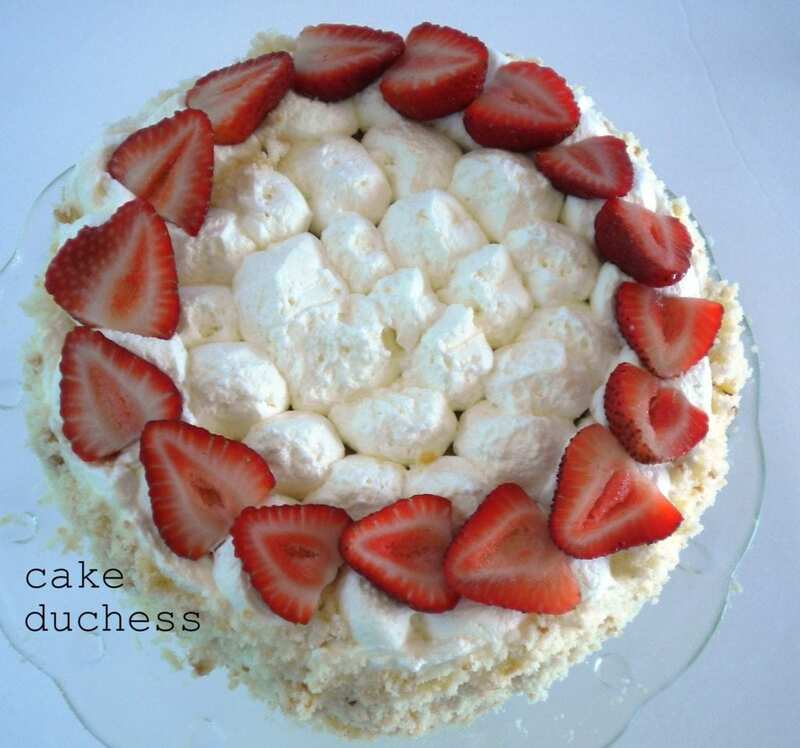 As with everything you make…this looks beautiful and delicious! I absolutely love the story and the cake. It looks so good! Yum! I wish i was eating a slice of this cake instead of my bowl of oatmeal for breakfast. Looks fantastic. What a great story! If that's what this caramel cake inspired, I want some! This does look fantastic. Wow. I'm such a huge caramel fan I was about ready to lick the monitor. Thanks for passing the recipe along. This looks great. I'm glad you showed us the inside of that cake too! Yum! Congratulations on the Top 9, Lora!!! This cake would be nice for the upcoming holidays and there is going to be a lot of dinners to go to. Thanks so much for the recipe to try.